I have a wandering (and wondering?) (and wonderful) toddler. The above picture was taken on a recent outing to the park, where, luckily, he has little trouble to get into if he scurries a bit out of reach. More troubling is when he gets loose at the gym while I’m trying to wrangle his sister into the car seat, and he runs into the gym where some boys are trying to play a game of basketball. Or most frighteningly of all, when he took his little hand out of mine in the parking lot and started to run towards the car. We had a big talk after that one. The truth about all of these runnings is that he knows he’s not supposed to run too far ahead of us. He looks back at us and gives us a devilish smile as if to say, “Come and get me!” It makes it hard to get mad at the situation for too long. In our back yard, his favorite game is to go to the only place I tell him to keep out of: my garden. Just like Peter Rabbit. Once he shimmies down the back stairs, he’s off and running to the edge of my garden, which wouldn’t matter except that I mulch the entire bed with grass clippings and he’s likely to roll around in it if not watched… His dad does the vacuuming and doesn’t appreciate these escapades. Soon, he’ll be old enough to help me dig and pick, but this summer is all about damage control. I can’t wait until he understands how his food comes from these plants. 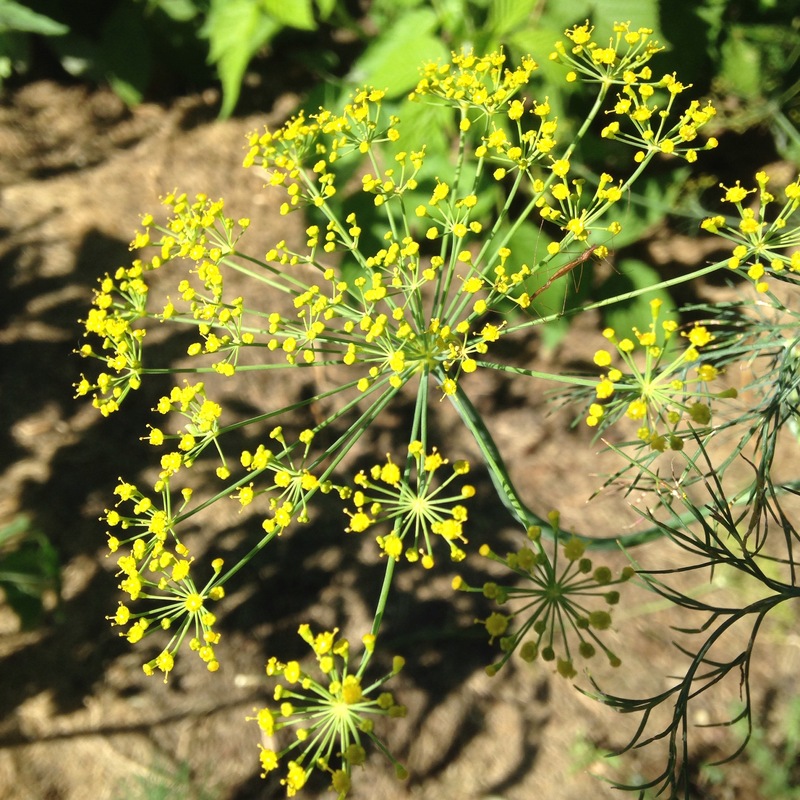 One plant currently overgrown in our garden is the dill, which is so fragrant that if the wind blows you can catch a whiff from the other side of the lawn. Dill belongs in potato salad, in my opinion, and so we’ve been chowing down on this recipe all summer. Don’t leave out the relish! It makes it something special. 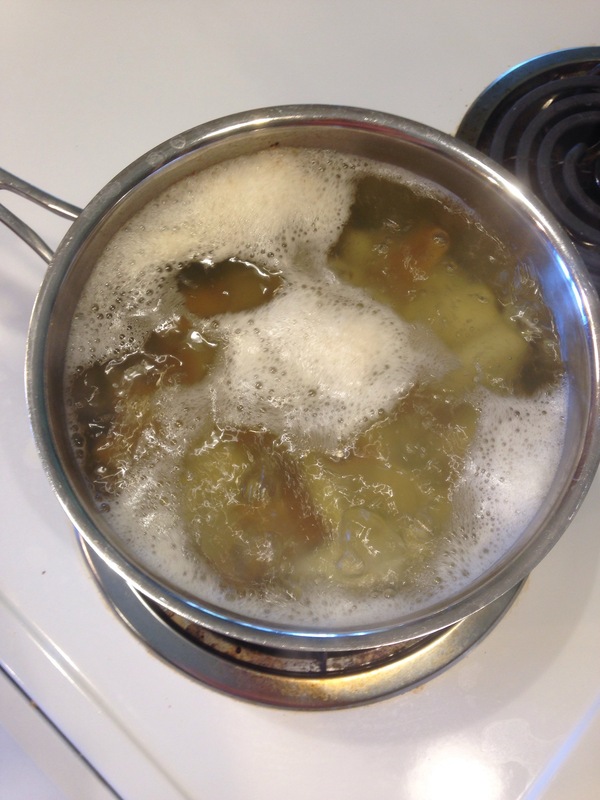 Boil cubed potatoes until they are tender, about ten minutes. Transfer to a colander and rinse with cold water. In a large bowl add celery, onion, eggs, and cooled potatoes. In a separate bowl, mix dressing ingredients. Add dressing to base, and let potato salad chill for at least 2 hours. Salt to taste before serving.